Happy Thursday, happy people! I'm headed over to my girlfriend's for a craft day and to kiss on baby Olivia (check her out HERE...is she not ADORABLE?? ), but before I go I have a couple of quick little Whipper Snapper cards to show you. 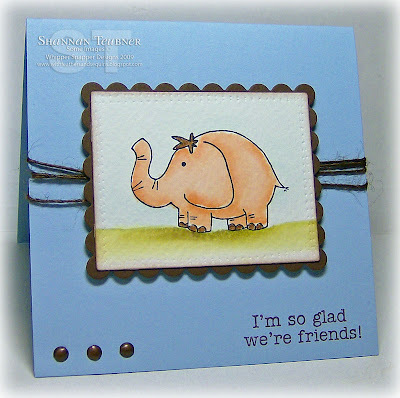 The other day I stamped out a few of the images from Anna's new Little Critters set and watercolored them, so I decided to make them into some simple little cards. 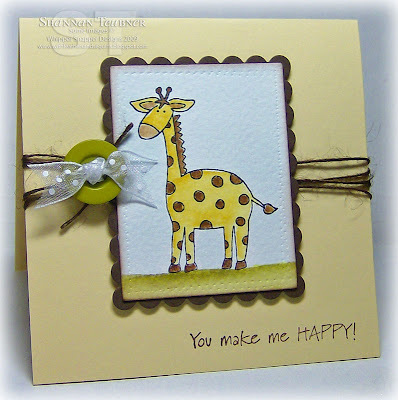 So I added the sentiment from Little Critters, as well as some twine and a button. I had this ribbon on my desk and really liked the contrast of the ribbon with the twine, so I just went with it. Kinda fun, I think! Ok, so I gotta go pack some stuff (what to take???? I'm stressing...), so I'll catch you later! Have a wonderful day! I love your watercoloring Shannan - you make it look so easy!!!! Oh my gosh, Shannan. . .ADORABLE! Super duper cute Shannan! Thanks for the great watercoloring tip - duh - I never think of these sorta obvious things without brilliant people like you telling me! Have fun with your friend and that ADORABLE baby (yes, I had to go look!!). Shannon, I love both of these cards. wonderful watercoloring job. I added you to my blog list a while back....But I'm ashamed of myself. Cause I rarely check out your blog. But believe me now that I have check out your blog. I will be back again!! Thanks for taking the time to create these wonderful cards. Have a super Easter too!